What a turn out on a less than desirable day! Eddie and Clouseau, Helen, Ben, Millie and Scarlett, Jo, Mark and Celeste, Lyndon and Dinah in their white 2cv, Spencer, off spring and their lovely orange mehari, Peter (yes Peter before lunch! ), Debbie and Millie and Other Peter and off spring in his GSA. Clive and Liza went one better by bringing TWO Gladys’ or is that Gladi? With them. 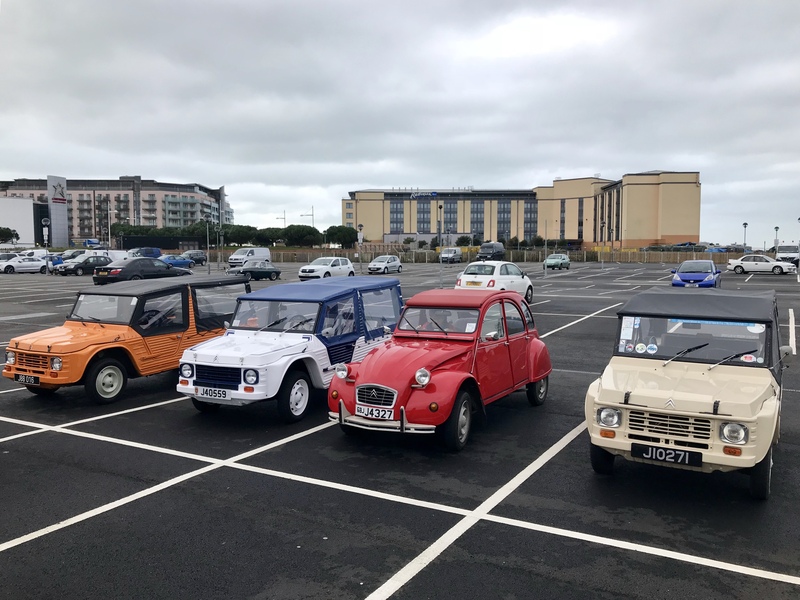 A fab little remote control version of the real thing went whizzing round the car park. 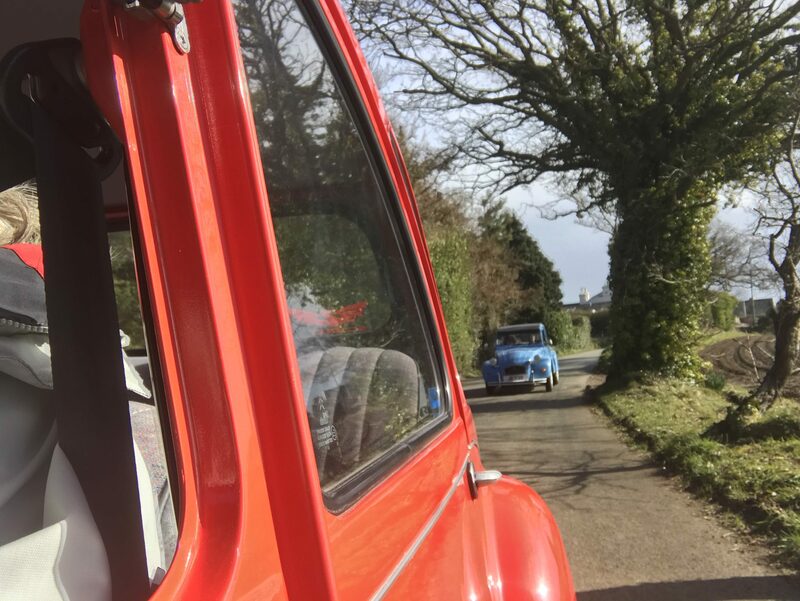 We welcomed newbies Steve, Claire and Hannah in Pixie a red 2cv and………even Little mule showed her face with Chris and child. 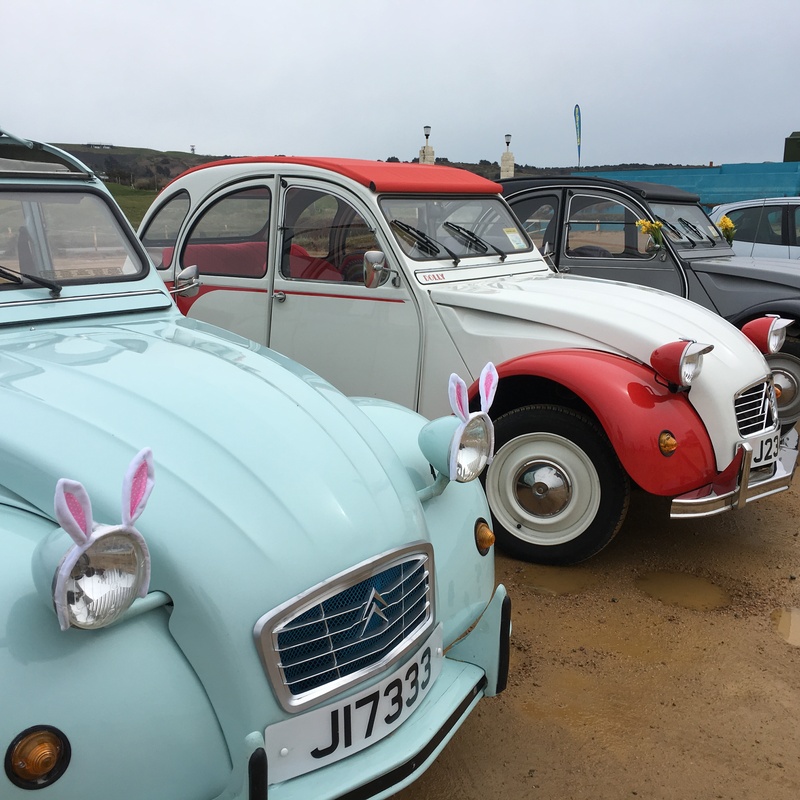 Of course a special mention to Lady Penelope and Parker (the AVs) in their Merc as their 2cv has now been valued at £12k so cannot possibly be driven when there is the slightest hint of rain! Due to impending Sunday lunch rush at the Portelet and the fact we had stood in the freezing cold chatting for so long in the car park, not to mention the back lanes to the pub would have involved hair pin turns and very steep hill starts we took the direct route and piled into the pub to enjoy chat, coffee and hot chocolates. It was lovely to see Sandra, twice in one week…..you’ll be getting in a car soon! Of course we missed those that couldn’t make it today and look forward to catching up next month for more fun and games. 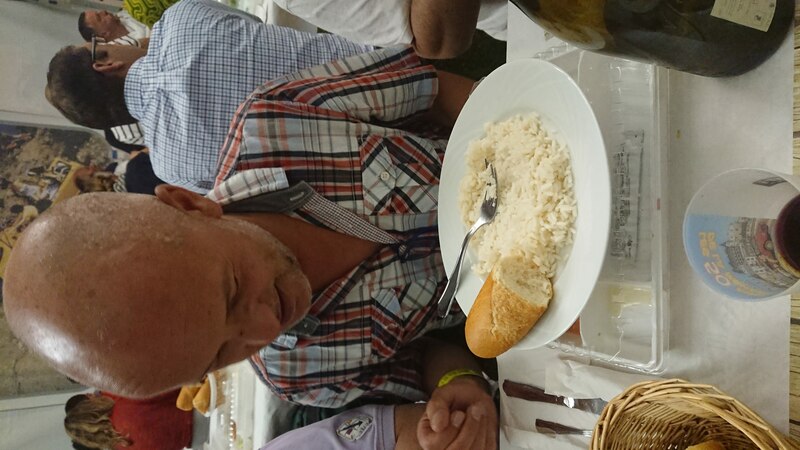 A special thanks to Eddie for organising the Raclette evening on Friday. Very enjoyable and only very slightly woolly on Saturday morning. 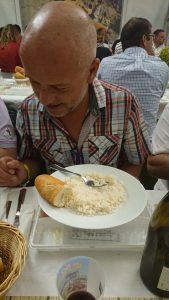 (I think the cheese may have been off!!!) As there were a few that couldn’t make it I suppose we will just have to do another one! 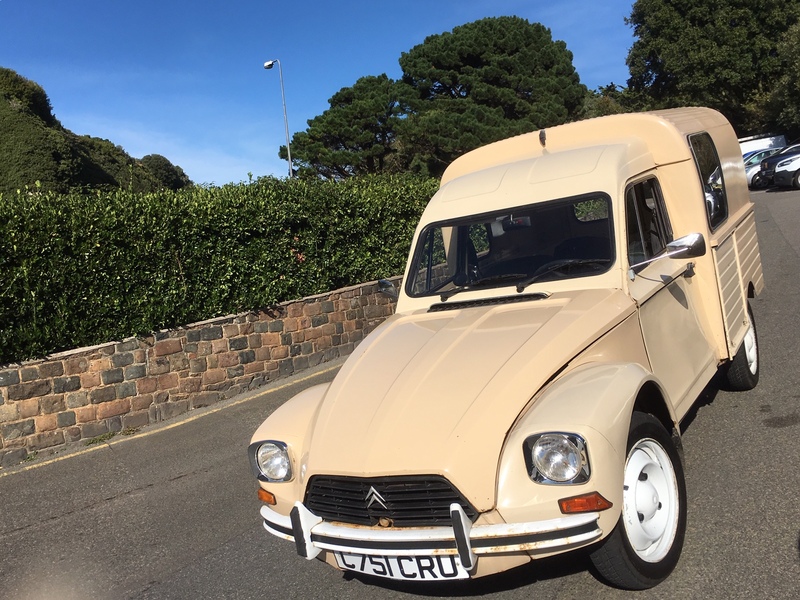 Happy 2CV’ing, see you next month. 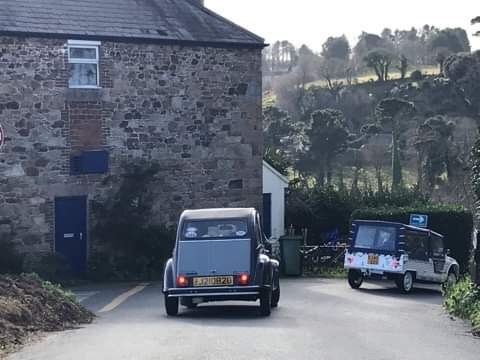 We thought we would cruise gently into the new year with a leisurely little pootle through the lanes to welcome in 2019 as we mean to go on. 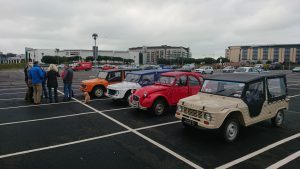 It was a relaxed 10.30 meeting time at the oh so attractive Waterfront Car park. 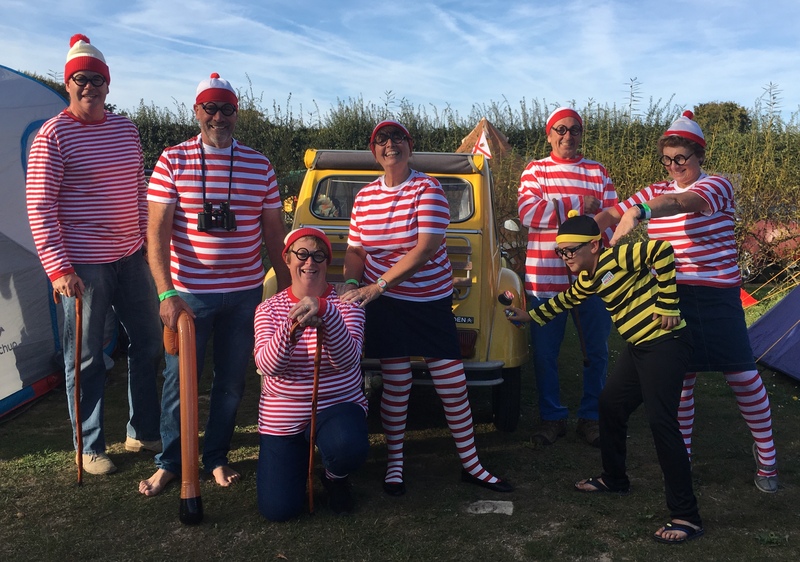 The weather was dry and the spirits were high as we all congregated and met old and new friends. Old friends know who they all are (if they can remember, that is! 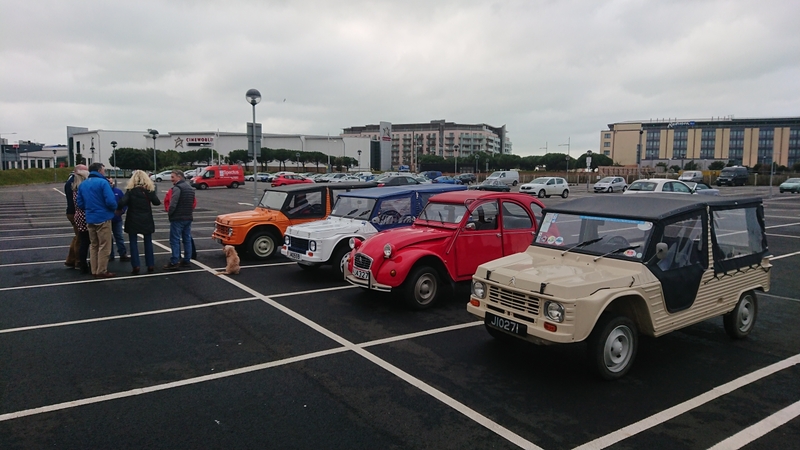 ), and new friends were met with hearty handshakes and nods of approval to the new Citroens in the clan. Annie & Gary found a Frenchman to befriend and Jason was there with his trusty old Citroen which Chevron will soon be knocking into shape, and this is before he brings his Dyane to the Island. 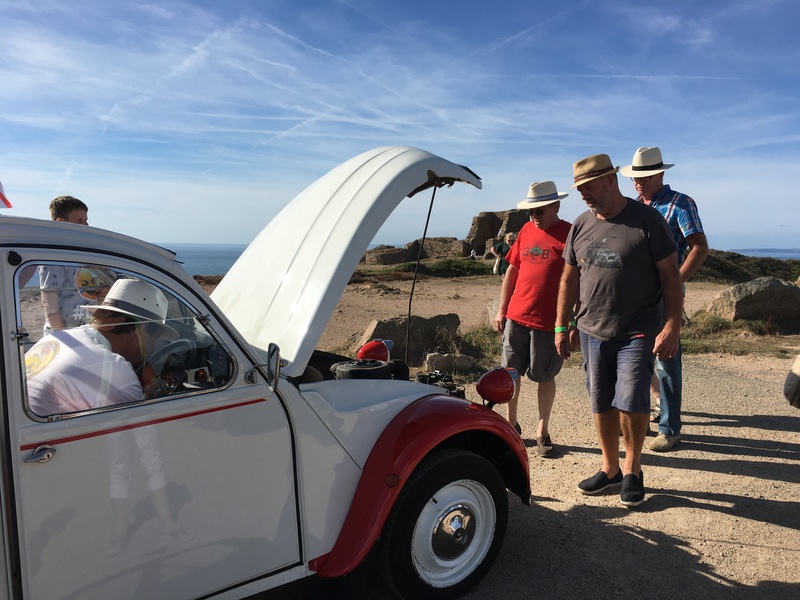 He is a long-time fan of 2CVs, having owned 2 Charlestons many years ago, so full of knowledge to be tapped, I am sure, especially that on performing the perfect hill start. We thought we were seeing double when the new Dolly on the block arrived. 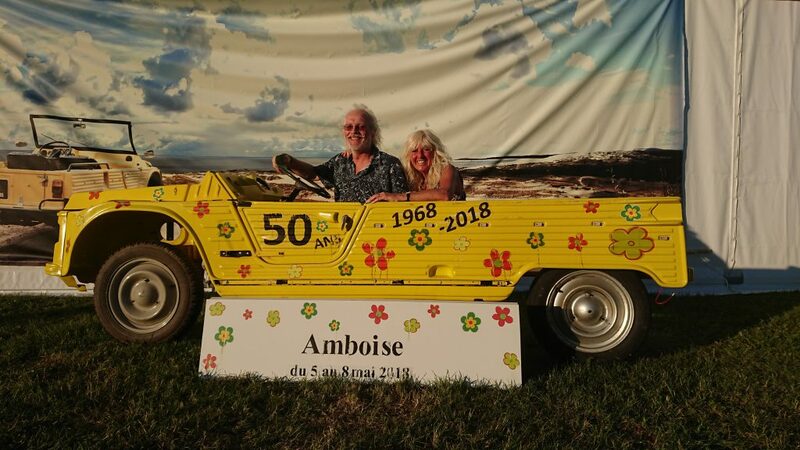 A beautiful green & white belonging to Sandra & Paul, delighting the crowds & stunning Clive & Sylvia as even her striped seats were identical to theirs. Hopefully Sandra will soon be back at the wheel following her baptism of fire to the Fast-Eddie vertical route……more of that to follow. Jo came flying in with Celeste, cursing the plague of traffic lights between town & Gorey, but it was great that she was able to say “hi” & “bye” before doing the airport run. So 10 of us trundled off towards the west (much to Clive P’s delight as he had to do East last week! 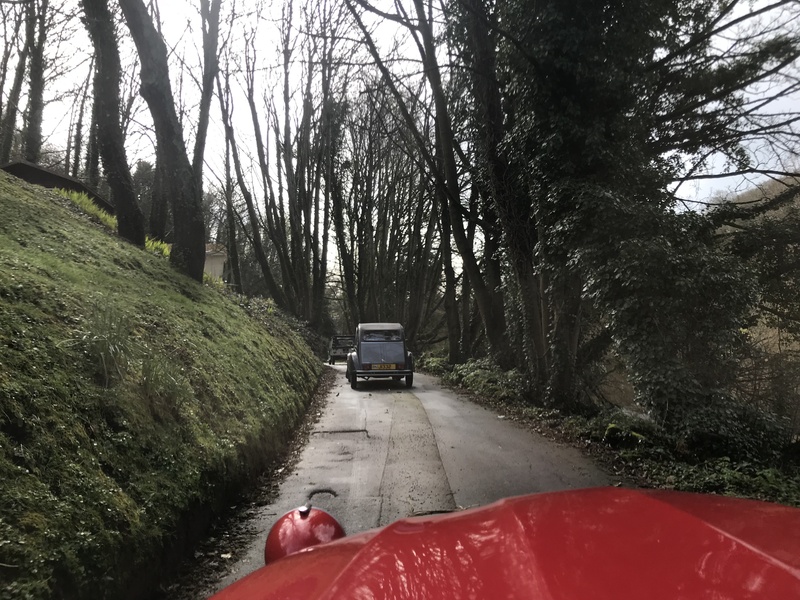 ), re-grouping on the road through the very beautiful Waterworks Valley, lulling us into a false sense of security whilst admiring the geese and toads. 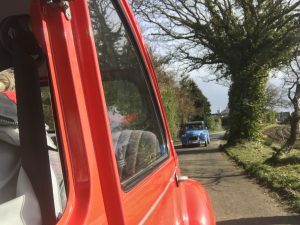 Fast-Eddie led us through some little-used country lanes, managing to avoid the joggers and cyclists en route. Somehow we ended-up at the eastern end of the runway as we came face-to-face with the landing lights – I was starting to think at that stage that we might be giving the Airbus A320s a burn up on the runway. Millie was starting to stress (reminiscing from last week’s hill start disaster), but she cruised up with no issues. 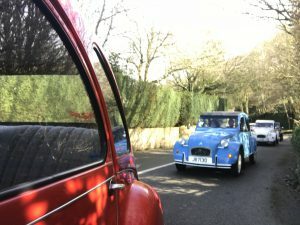 Further back in the fleet the air was turning blue, so much so that Sandra failed to find first gear and calmly (not) removed herself from the car and announced she was walking home!! Fortunately Paul slid over to the driver’s seat, gave Sandra a valium & persuaded her back into the car & completed the hill climb. 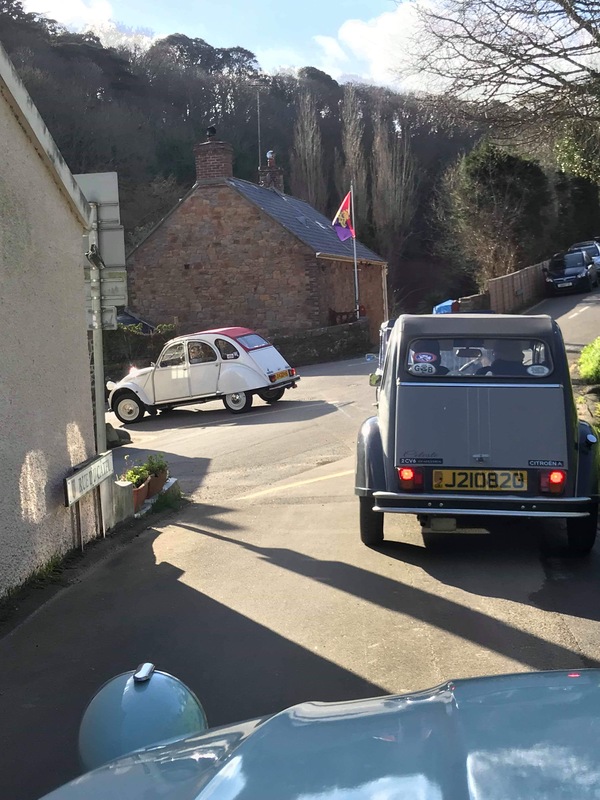 Blanche (carrying Jac’s 94 year old Mum who can’t quite believe how social we all are) was breathing-in towards the top of the hill to squeeze through the Sunday drivers going downhill, and we eventually all ended-up at Portelet Inn where we were met by Steve & Lynne. Mr & Mr Claus paid us a visit…. Hot chocolates, coffees, teas and Brandy (medicinal purposes for some of the newbies) later, we all caught-up with Christmas and New Year exploits and thoughts of summer 2CV outings ahead. Santa’s little elves in the form of the Austin-Vautiers arrived with a sack full of lovingly packed gifts for us all. 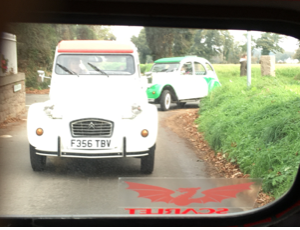 There were smiles all round and even Fast-Eddie was forgiven for turning left and not right. See you all again for our next drive on the 3rd Feb – 1pm at Highlands College. 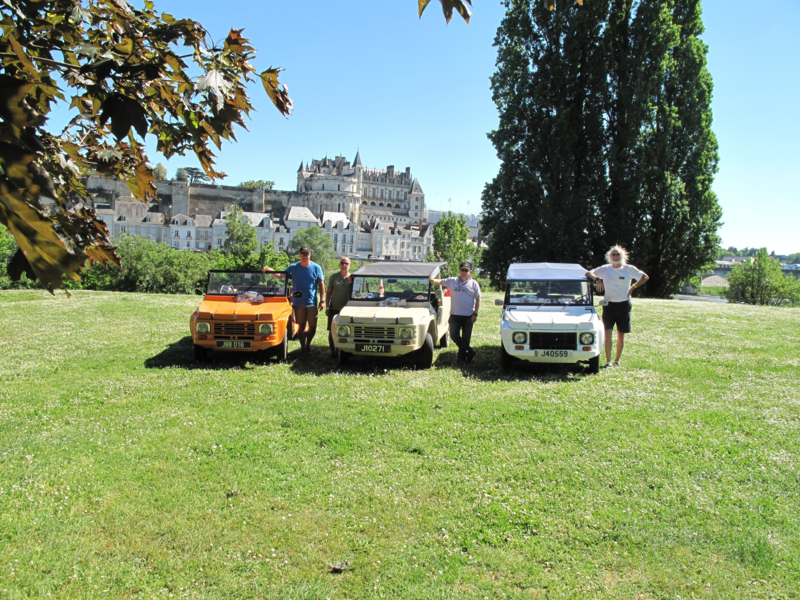 Clive and Sylvia changed the colour scheme when they arrived with their green and white Dolly and were closely followed in by Millie – driven by Allen today as Debbie was singing in Prague – as you do! (Huge congratulations to the Holmchase Choir for their two gold certificates at the international festival!) The AVs arrived looking splendid in Earl Grey and, after a quick chat to Murielle, who sadly couldn’t join us today, Eddie led the pack off on the drive. So where did we go? I really have no idea – suffice to say that the route was superb, thank you Eddie. The criteria seems to have been to avoid main roads at all cost. Just traverse the island from east to west, only briefly crossing any main road encountered! We definitely set off down la Rue a la Dame to Grands Vaux reservoir, then uphill again eventually crossing Trinity main road. 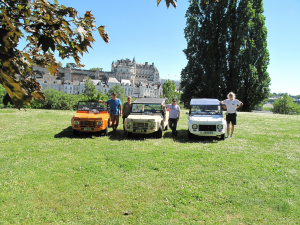 We also crossed Mont Cochon and St Lawrence main roads and dipped into Waterworks Valley (a favourite) but didn’t really drive along a main road until we came down behind the quarry at Granite Products and joined St Peter’s Valley. 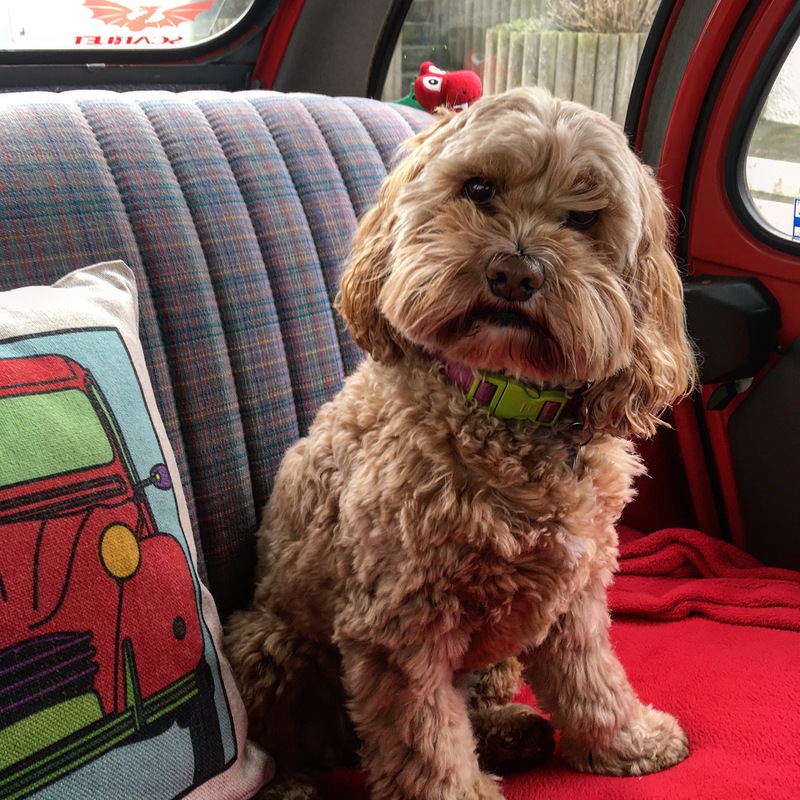 Reg seemed delighted to welcome us back and wants to know when we are hosting our next camping weekend in Jersey! He provided teas, coffees and biscuits and had arranged a little indoor seating area for us. What an absolute star! General chatter ensued, including discussion of next year’s Breton meet which seems to be becoming quite a favourite. 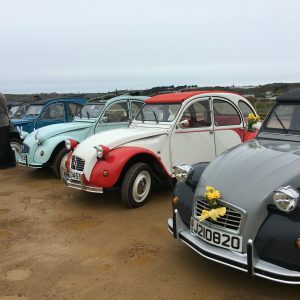 So tough for those of us who can’t make it – weddings should not be organised before prior consultation to the 2CV events! 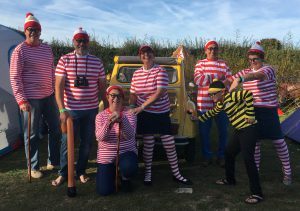 Next event for us – dinner at the Goose on the Green. Tuesday 13 November – please let Murielle know if you would like to join. Write up & pictures Helen Cornish. Not having taken part in the last few club runs and meetings due to work commitment, I was delighted to be joining the group with Miss Titinne this Easter week end. Little did I realise that it was also April fool’s day and upon arriving at the rendez-vous point (with about 10 minutes to spare may I say), I thought that perhaps I was the victim of an April fool as Celeste, Jo & Mark were the only one there. 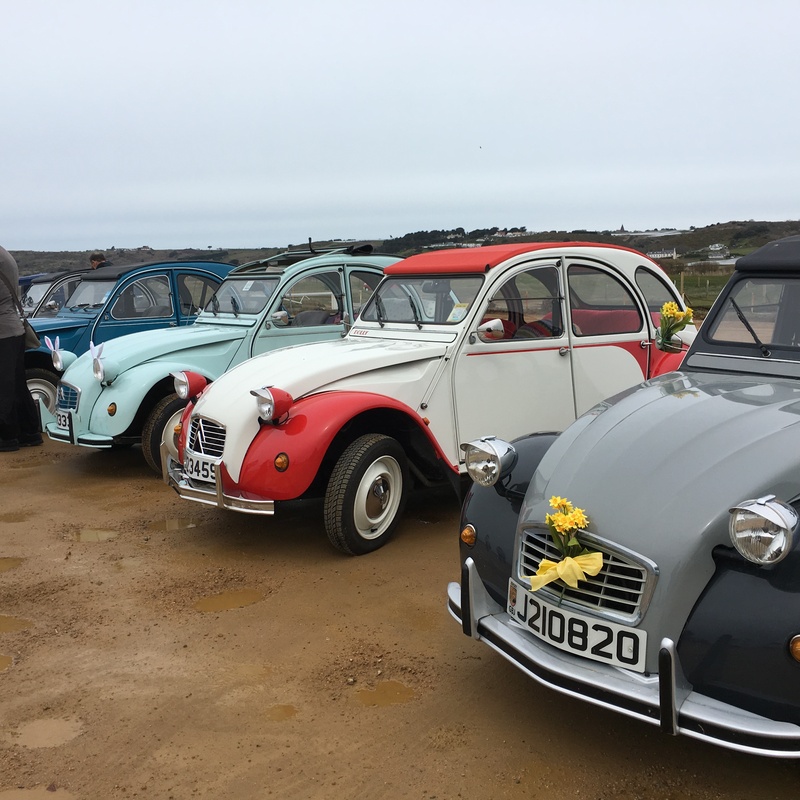 We grabbed a couple of bacon rolls, and before too long (well 10 – 15 minutes after the due time) the others started to trickle in, Eddie, Annie & Gary, Spencer & Julie, Debbie & Allen (Debbie now being the proud owner of Millie, a light blue little beauty). Celeste looked ready for spring today with her lovely daffodils decorations and Millie’s Easter bunny ears gave her a little cheeky look too ! 10/10 for effort to their owners. So off we went, with Jo & Celeste at the head of the convoy since she was first on the scene, we cleared some much needed parking spaces at St Catherine and headed towards the West. And as we were leaving, who was coming from other direction? Lynne & Steven in their Earl Grey…. who it, turned out later, had to make a petrol stop on the way which had delayed them. The route took us through Gorey village, along the coast road, up Mount Bingham, along the old harbour, through the esplanade, where fast Eddie (yes Debbie, the nickname will now stick) decided to leave the group and head toward a petrol station and then home. 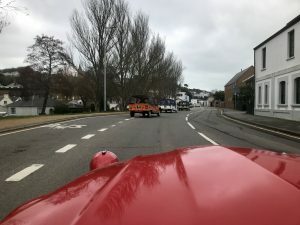 then through St Aubin, and it later came to my ears that Jo was thinking about going up Ghost hill in St Aubin, but thought better of it or “Murielle (me) will kill me”…. She was quite right there, hill starts in Titinne are not my forte having short limbs, I find hill starts a bit of a challenge…. So thank you Jo for changing your mind 😃. We then drove through St Brelade, down La Pulente to park our rides at the Watersplash to partake in hot beverages and have a catch up. You don’t have to be mad but it helps…. It downed on me when we left, that all of us lady owners of 2cvs and meharis have got one thing in common, Jo, Lynne, Annie, and myself, are all outgoing and dare I say it, a little bit batty, we still have to discover the batty side of Debbie and Helen, but I am sure we will see it when we go to the French week end in June…. Until next time… keep on driving! 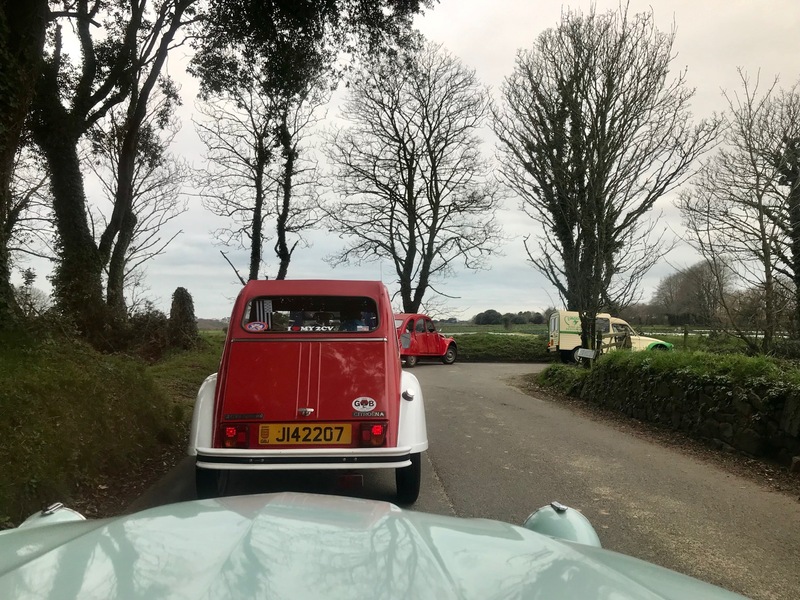 After the snow and wind earlier in the week we were promised some sunshine and out it came, along with half a dozen or so 2CVs and a Mehari for the early Spring meet. 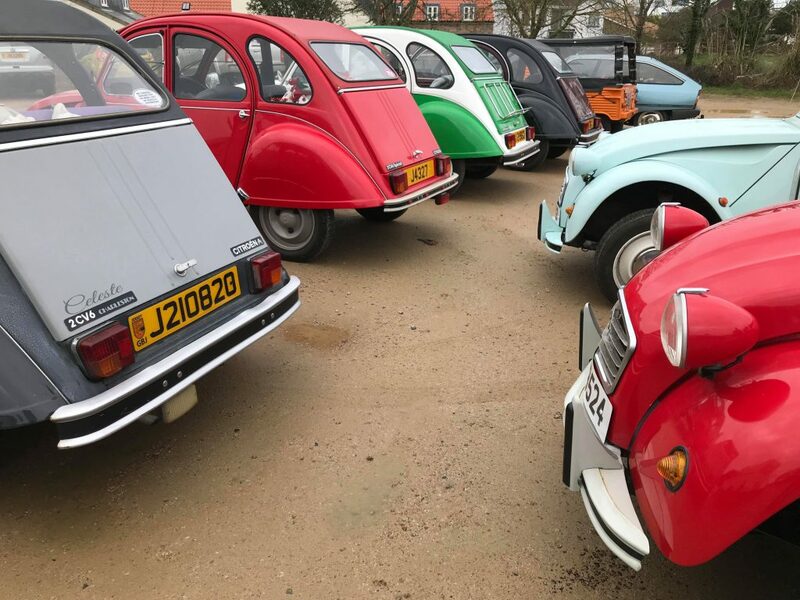 Not that a few flurries of the white stuff would put anyone who owns a 2CV off as apparently they are the best cars in a snowy crisis! First to arrive at St Catherine was Fast Eddie and Helen & Debbie soon joined him in Terry Le Main’s Gogo Bar for a quick bacon roll before the other tin snails arrived. 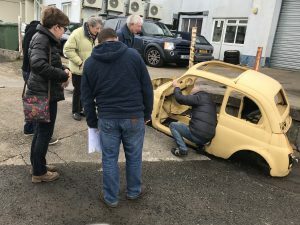 With the ugly plastic conservatory having blown away, everyone was able to watch the parking skills of the later arrivals whilst congregating at a leisurely pace in the café before setting-off towards the Goose on the Green. 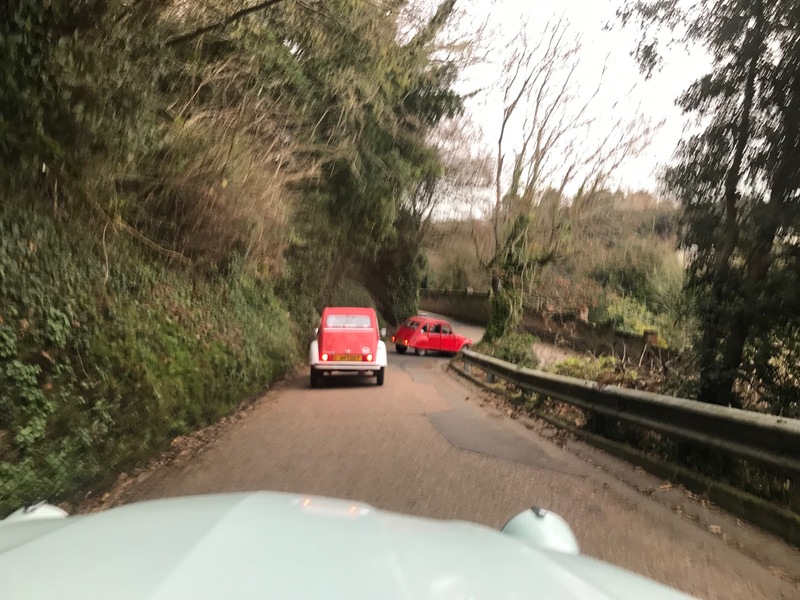 Even Peter (our chairman) was early (his coughing was preventing him from lying in), and he was swiftly followed by the Pallots in the 2CV with no name, Duarte & Paula in Cecille, and the Austin-Vautiers in Quackers. Fast Eddie took off to lead the fleet on an interesting route through the delightful lanes in the northern parishes, taking in St Martin, Trinity, St John, St Mary and St Peter. The pace was good and we managed to stay together, amusing many onlookers as we glided past. There were a few challenging ascents thrown into the mix, when one driver who shall remain anonymous took a late decision to drop down into first gear and consequently backed-up the fleet who were soon on his tail. The hedgerows were looking beautiful in their coats of many daffodils. 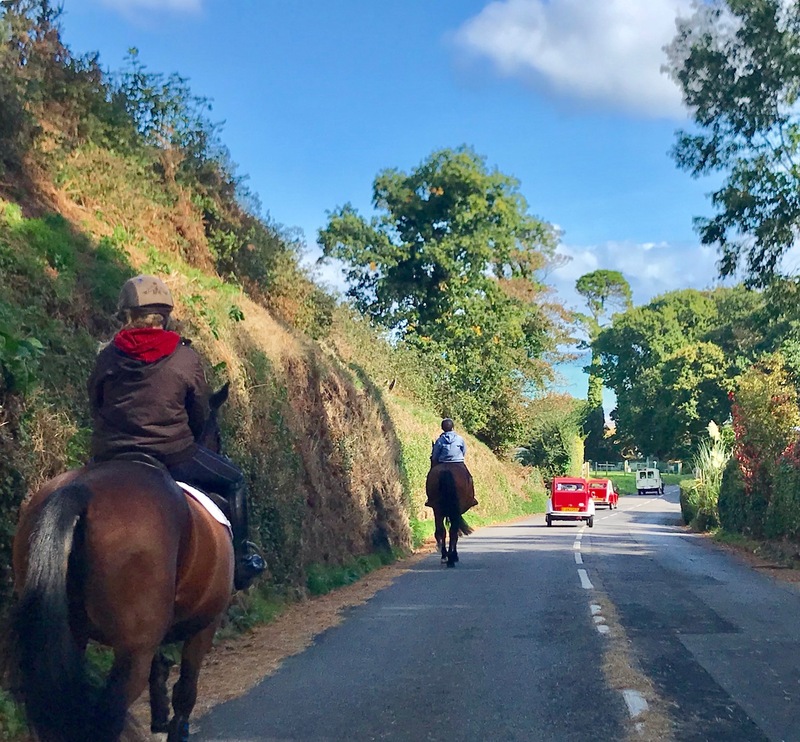 As we neared St Peter’s Valley we took a pretty short-cut down La Rue de la Potirons and La Dimerie, and at that stage we thought Eddie might be leading us down his new cycle route through the valley, but it was already being well-used so perhaps we shall save that for another day. Having parked at the Goose we were met by Spencer and a very fetching yellow Fiat 500 which drew great interest from the car collectors within the group. 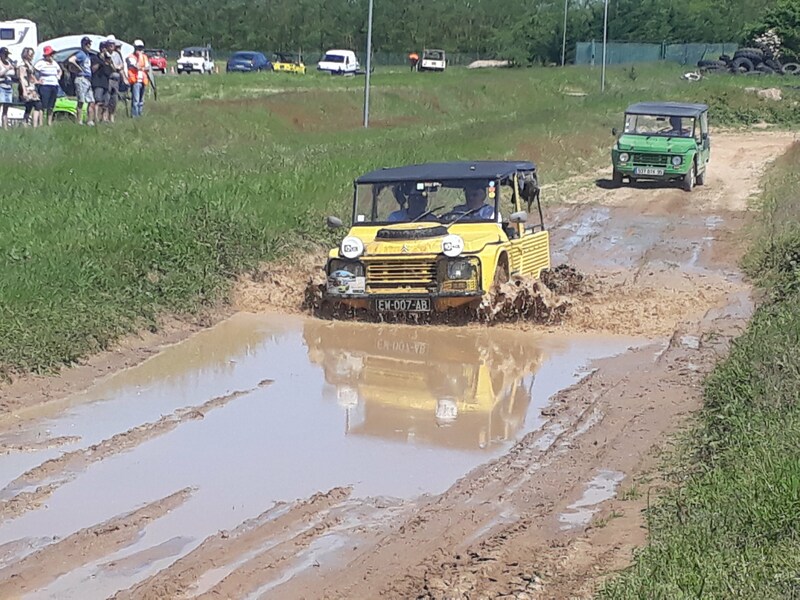 As keen as they might have been, even this one was perhaps one challenge too far. But who knows……. Only for the die-hard crew! 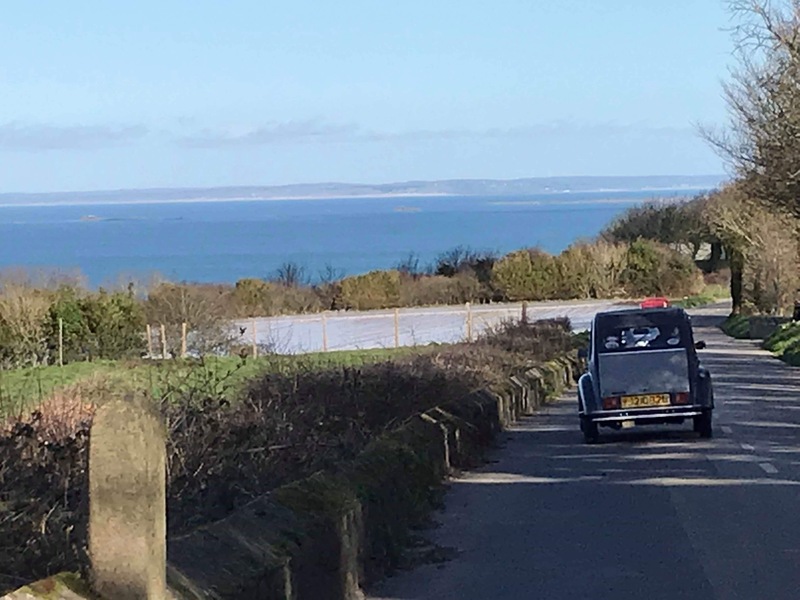 The words from Meatloaf – “It was a hot summer night and the beach was burning” – were hardly running through our minds when we opened the curtains on this cold January morning. We are not soft southeners, however, and when we have a 2CV Club De Jersey meet then we sure have places to go & things to see. A few apologies started trickling-in due to the force 8 winds and general damp stuff, but that would not put-off some of the die-hards. 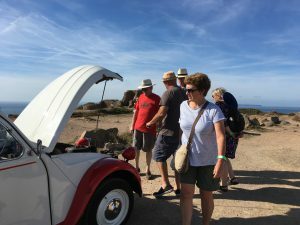 First to arrive at Jardins de la Mer (such an exotic-sounding name) were Annie & Gary in Cassis, soon followed by Helen, Ben, Millie, Debbie AND Allen in a very laden Scarlet. 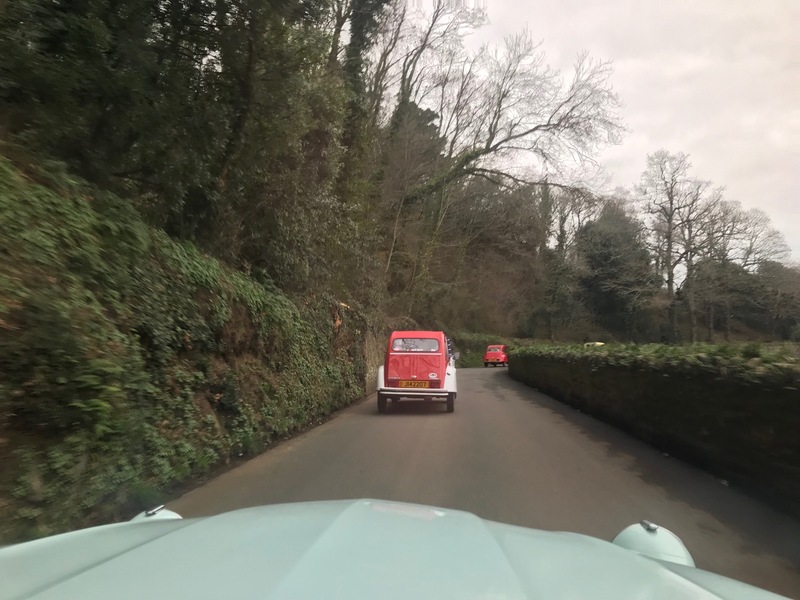 Yes, ‘Debbie does’ have a husband and this was his first meet with the Club in anticipation of Millie their car joining the group sometime this year! Then arrived Fast Eddie sporting his cosy topsides, and finally a new recruit – introducing Spencer and his son with ‘It’. 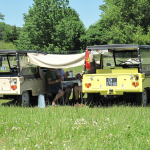 ‘It’ is a super smart Mehari, recently purchased and beautifully restored by his new owner, Spencer Raynes. Spencer had contacted Murielle on the Club Facebook page and enquired if she knew of any Meharis for sale, and lo & behold, Spencer had become ‘It’s owner within a couple of hours thanks to Murielle’s introduction to a willing vendor. 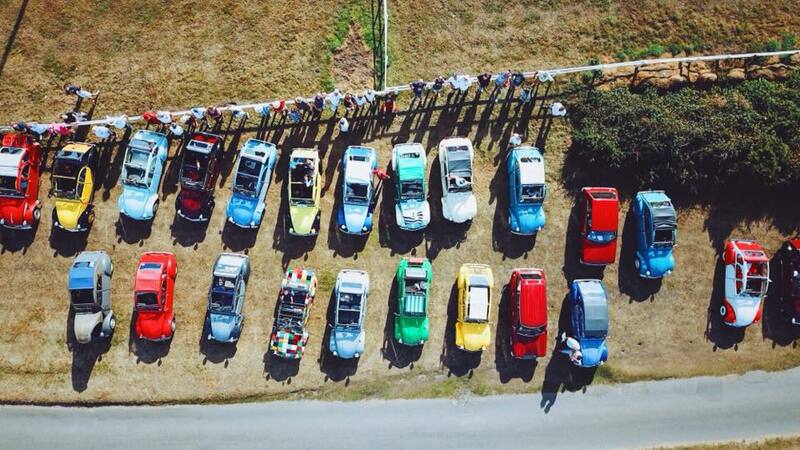 So there we waited for 40 minutes whilst a scattering of classic cars and motorbikes arrived, but no more 2CVs. Scarlet was out-numbered by 3 to 1 by the Meharis which was such an unusual scenario! We decided to make a quick exit with the thought of a bacon roll & hot drink at St Catherine’s café in sight. Fast Eddie took off at lightning pace, followed by Cassis, It, and Scarlet. 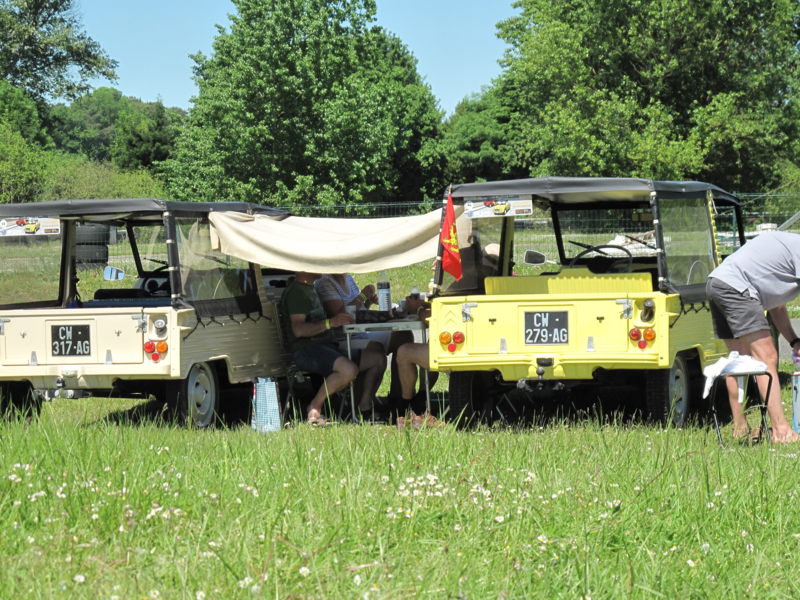 Annie was delighted to follow a fellow Mehari so she could see what a Cassis-type looks like from the rear! ‘It’ had a port lean due to book-reading son being a quarter size of his Dad, but ‘It’s orange paintwork glistened beautifully in the spray. 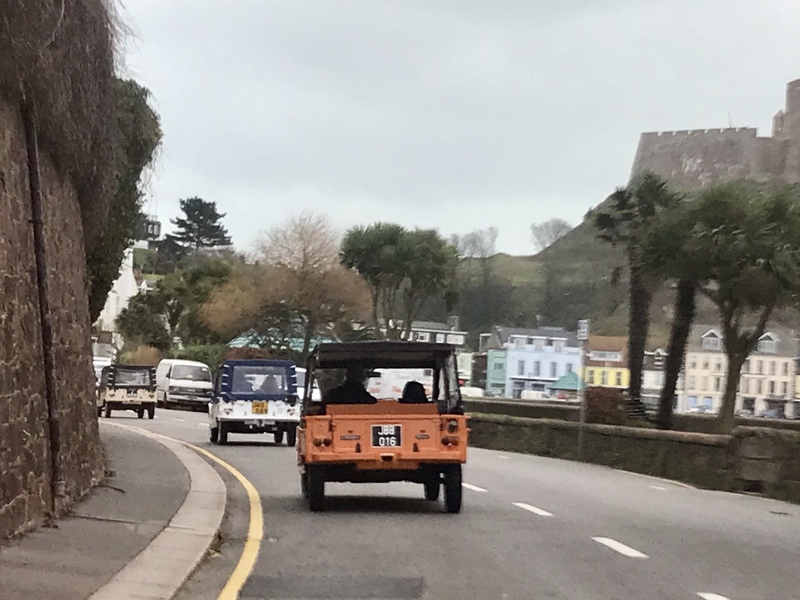 It was to be the quickest route possible today – through the tunnel, Grouville hill, Gorey, & Coast road to St Caths, dodging the waves & holding tight to the steering wheels during the gusts. We literally had to stop on the Pinewalk to wait for a lull in the waves, and again at the Breakwater where the sea was as rough as ever as far as the eye could see. 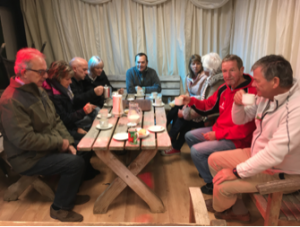 Phil Rondel (hardly recognisable without his Christmas suit but it was the glasses on his head which gave him away) caught up with us at the café and it was soon time for a dive into the wind-battered shelter for that hot drink. 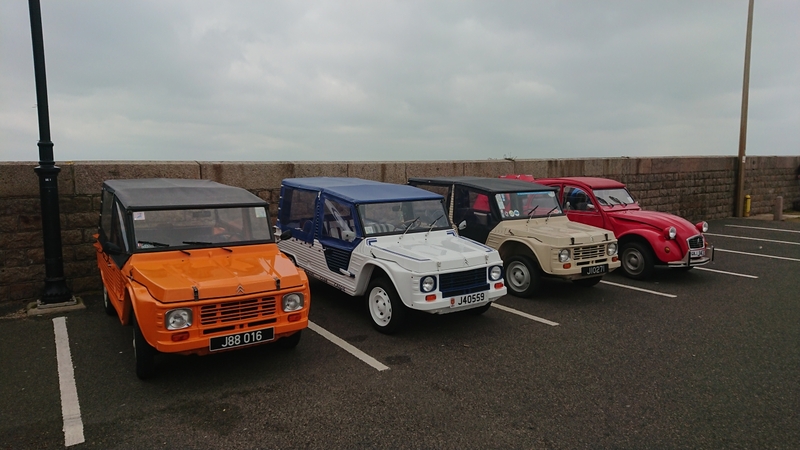 We missed our fellow owners, many of whom had work commitments or Tan Hill raids to attend, but we discussed the French Mehari meet in May and the 2CV de Bretagne meet on June 16th, as well as the many local meets we have to come over 2018. Happy New Year one & all, from all in the Club! Very last minute decision, got up ready to go heard the wind down the extractor fan, looked out the window mmmmhhhh. Back to bed checked emails in case it had been cancelled. 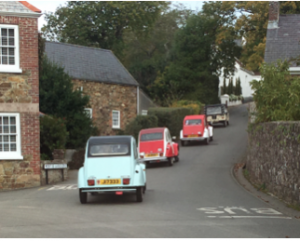 Imagined our little fibreglass car doing a Mary Poppins! Decided probably not today, then heard Debbie and Helen the boys and Millie were going. So out of bed again, got ready and off we went. We sat in the car only ones there. Hooray Helen turned up, then Eddie and another Mehari Spencer and his son arrived. Beautiful orange one. It was jolly cold standing out in the car park chatting, so we drove to St Catherine’s cafe. Boy that sea was wild!!!!!!!!!!!!!!!!!! I think Helen had a wave over her car after Anne port. 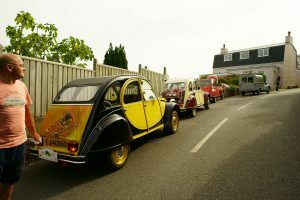 The vintage cars were meeting at 10 30 for 11 00 so least we got to the cafe before it got busy. Those waves were pretty scary . We were so cold those bacon rolls were so welcoming. Think all the cars had a hose down back home sea spray on all of them. Cassis is back in the garage and dry again. Let us know if we are having a meal out before the next run in February. Stay warm and safe. Glad we don’t have to go out again today.